We first heard about Chi Phat, Cambodia’s community-based ecotourism project, while sprawled out on floor cushions at the Ten103 beach bar on the castaway-esque island of Koh Ta Kiev. Swirling paper umbrellas in our passionfruit margaritas, we were contemplating our next travel move as the sky above drifted into lilac and peach hues. While the beach life had been a great source of much-need relaxation, it was time to head back out on the road again. But to where? 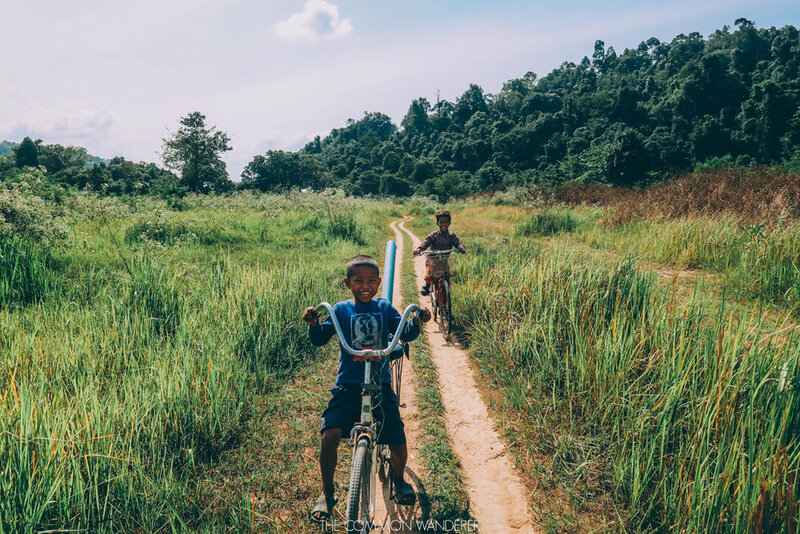 We definitely wanted a change of pace and scenery, but also desperately wanted to find something that went beyond the usual backpacker highlights of Cambodia. Something unusual, and a little adventurous. So when the girl from the couple next to us leaned over, exclaiming that we "simply had to get to Chi Phat and the Cardamom Mountains", our curiosity was instantly piqued. "It's just incredible," the bangles on her arm jangling together wildly in agreement, "a total mission to get to, but so worth it. Best thing we've done in Cambodia". Three days later, we were rolling out of Phnom Penh en route to the project, buoyed by her tales of jungle treks, hidden waterfalls, and sleeping under the stars. Turns out she was right on both points. Chi Phat was the best thing we did in Cambodia, and the project is also a mission to get to. Nestled deep in the heart of the Cardamom jungle, about 17km from the nearest town of Andoung Teuk, it's remote, and definitely requires some forward-planning. Here's our guide to getting to Chi Phat, from (almost) everywhere on the Cambodian backpacker route, including prices. Getting to Chi Phat is definitely part of the adventure! The community is 17km upstream from the nearest town of Andoung Teuk - which also happens to be the start and finish point for all your adventures here. Because of that, we've split this guide into two sections: Getting to Andoung Teuk, and getting from Andoung Teuk to Chi Phat. Getting to Chi Phat from the east of Cambodia is extremely straightforward: jump on a bus bound for Koh Kong along Highway 48 and let your driver know that you’ll be jumping out at Andoung Teuk. Unfortunately, you’ll still have to pay for the whole route through to Koh Kong, but Cambodian bus transport is pretty cheap comparatively. The drive takes about 4-5 hours depending on congestion, and travels along the main (paved) route connecting Phnom Penh to Thailand. Your driver should know exactly where to drop you off, though it might be worth bringing a map to show, or asking someone to write down Andoung Teuk in Khmer for you just in case. At this point we feel we should probably give you a heads up: if you jump off the bus in Andoung Teuk only to panic that you’ve been stranded in the middle of nowhere, don’t stress. There are two drop off points: the turn-off for Chi Phat (just a few small stalls), and the town of Andoung Teuk itself, a very small highway town, not much more than a couple of buildings either side of an intersection. You’ll be able to organise onwards transport at either point (more on that below). *note: often buses will leave when they’re full, rather than by scheduled departure time, so factor this into your planning. The Sorya Company was operating a service between Phnom Penh, although recent reports suggest that this is no longer the case. With the exception of the starting point, the journey to Andoung Teuk from Sihanoukville is basically the same as the one from Phnom Penh. Previously, the trip used to involve ferries and could take up to 12 hours to get between Sihanoukville and Koh Kong; these days the travelling is far easier, with the NR4 and NR48 roads recently having been re-paved. Buses depart from the main Sihanoukville station daily, and you’ll need to book your ticket all the way through to Koh Kong (but get out at Andoung Teuk as above). If you’re travelling from Kampot you’ll need to transit through Sihanoukville to get to Chi Phat. The trip from Siem Reap to the Chi Phat area is around 8.5 hours, so your best option is to bus to Phnom Penh one day, then follow the above instructions to get from Phnom Penh to Chi Phat the following day. Pretty much the same trip as above, just in reverse! Take the bus to Phnom Penh from Koh Kong’s central station, and get out at Andoung Teuk. Again, you’ll need to pay full fare from Koh Kong to Phnom Penh. Note: you can now book all your bus tickets using BookMeBus.com, just search using the widget below and select your dates! This two-hour boat ride up the Stung Phipot (Phipot river) is the most peaceful and scenic way to complete your trip to Chi Phat. Snaking through thick mangroves and forest landscapes, the cruise is picturesque and also provides a great opportunity to spot some of the local wildlife (monkeys and birds are common here). The boat costs around USD $10, and normally leaves around 12:30-13:00 (when the Virak Buntham bus arrives from Phnom Penh) - although this may be pushed out if the bus is running late. If you arrive after the boat has already left (and you’d prefer to stick to the rivers to complete the journey), you can also rent a community boat though this may be more expensive. This was the option we decided to take, and while it definitely wasn’t in our plan (Mim’s golden rule of travel until now had been to never jump on the back of a motorbike! ), we had arrived too late for a boat transfer and there were no community boats available. Turns out, this 45-min, white-knuckled ride through fields of sugarcane and rural life turned out to be one of the most fun experiences of our time in Cambodia. If you don’t already have a booking pre-arranged with the Chi Phat info centre, just walk to the restaurant on the main road with blue pillars and organise a driver from there. Generally, moto-taxis should cost about USD $7. Private transfers can also be arranged from Andoung Teuk to Chi Phat, but you'll need to arrange this well in advance, and we’re not sure on cost. We like to keep these posts as up to date as possible to benefit you on your travels. Have you been to Chi Phat community based eco-tourism project recently and discovered transport has changed? Share your tips in the comments below! THINKING OF VISITING CAMBODIA? READ THESE POSTS FOR INSPIRATION!